This has been a sad week. Tuesday saw the fourth anniversary of the death of the founder of this, the world’s best ill-informed blog. In the months leading up to his death, Stewart was aware that his time was limited. Indeed, although he lived until the August, he knew in January that he didn’t have long to live (See http://www.thegrambler.com/2013/01/week-22-cest-le-grambler-finalment.html). That gave him and Geraldine a long time to discuss the kind of things that most people don’t ever have the chance to talk about. They even chose the minister who would be perform Stewart’s funeral. On the anniversary of his death, we, his family, remembered that funeral. That sounds ultra-depressing, doesn’t it? But we were actually sharing some amusing memories. On the day, we asked mourners to share their funnier moments with Stewart by getting them to write their thoughts down. Having not seen the slips of paper for almost four years, on Tuesday, we read some of these messages again. I hope his friends won’t mind me sharing some of them with you. They weren’t always entirely complimentary. Many jolly parties were mentioned. Stewart always seemed to be the one that would do the daftest things. When he had long hair, he let the other partygoers put his hair into bunches using elasticated baubles. Not just one or two bunches; dozens of them. So he looked ridiculous. Who cared? Another occasion somebody wondered if you could ‘snort’ sherbet. Geuss who tried it. One person’s memory was of when he took his passport to school on his 18th birthday so that he could go out for his first legal pint at lunchtime. Lunchtime! School lunchtime! Another recalled how at a wedding he taught everyone to do the Scottish dances and later began a conga line and as well as providing suitable noises and chants. Others recalled his playful sense of humour which quite often got him into trouble... Rearranging the cones at a roadworks so that drivers had to stop and move them before being able to drive on. Or when doing something similar on another occasion he was invited to sit in a police car to explain his ‘Alan Partridge moment’. Apparently, they saw the funny side too. Other times his idea of fun upset people. Calling the quizmaster’s mother something very rude at a pub quiz was not the most sensible thing to do. And if you are standing next to someone wearing a check shirt, you perhaps shouldn’t start singing the Monty Python ‘lumberjack’ song at the top of your voice. Going with Stewart to some unusual gigs was another thing that his friends remembered. The Leeds festival of 2005 was one event recalled for some odd moments... Stealing beer from lorries? Singing Merry Christmas Everyone (the Shakin’ Stevens song) at the height of summer. Starting random rumours like telling everyone that Neil Buchanan had died of an art attack. Arriving home in scruffy jeans and teeshirt but wearing a black dinner jacket complete with silk lapels bought in a charity stall at the festival. Another friend recalled the time that he and Stewart were singing karaoke so badly that someone actually threw a shoe at them (The song was Peaches by Presidents of the United States so who could blame them?). His fussy or unusual eating habits were also remembered. The time he was offered pie - ‘Don’t like that kind of pie.’ A cheese sandwich? - ‘Don’t like that kind of cheese.’ A piece and Jam? - ‘Don’t like that kind of jam.’ Yet he would eat fried pancakes. Yuk! Many remembered his time as a rock star in the band called The Incredible Monkey Man (They became (very) local celebrities by winning a battle of the bands competition.) and especially the song they had in their repertoire relating to a famous TV celebrity which may or may not have been libellous. ‘Whenever the subject of our wedding would arise with friends or family, the rendition of ‘500 Miles’ by Stewart, Colin and Kevin always gets brought up. 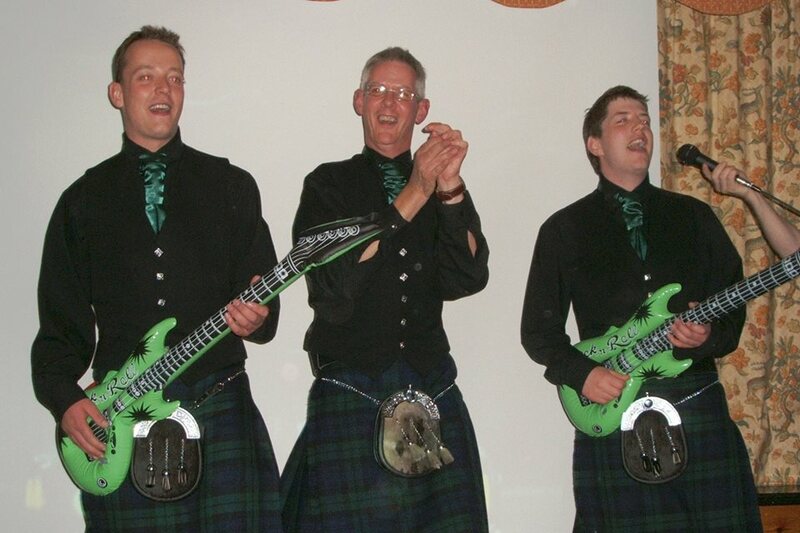 It seems that playing an inflatable guitar in a kilt on stage is a show stopper at any event. ‘To Geraldine and Stewart’s family. I wrote another story of memories, but this one I wanted to be more personal. I’m so happy Stewart had [Geraldine] in his life throughout the last four years. Geraldine was perfect for him and kept him strong throughout the pain. I always joke about my ‘25 month plan’ where I plan my life to have all the necessities - a good job, a house, a good wife and a family. Turns out Smit [Stewart] was many steps ahead of me, he had everything I wanted and it kills me to see him taken so early. Geraldine gave him all this and I will be forever thankful for that. I just can’t believe he’s gone. And I can’t believe our music career never took off, we were destined to be rock stars together. It was an honour to be Smit’s friend, see him through school, attend his wedding and, unfortunately, attend his funeral. [Stewart’s mum] asked us at the hospital in January, ‘You’re not going to forget him, are you?’ I promise you, that will never happen as the boy Smit is unforgettable. He is a true gent, a great friend and, above all, an absolutely terrible trombone player. And now... The usual drivel. I see Wean Rooney has been charged with drink driving. Police officers stopped his black Volkswagen Beetle at 2am. Shocking isn’t it? It’s absolutely disgraceful from such an influential individual. What kind of example is that to be setting? A VW Beetle? What the hell was he thinking? Were any famous or notorious people born on the 2nd of September? Of course. Here are some I’ve even heard of. Bill Shankly 1913 (Footy bloke. ), Hugo Montenegro 1925 (Composer. Would you like to hear his most famous piece? Although he didn’t actually write this, it is considered to be the ‘definitive’ version. Ladeez and Genullum, I give you lo bueno, lo malo y lo feo. ), Victor Spinetti 1929 (Welsh actor, isn’t it. Factoid: He is the only actor to have appeared in all the Beatles’ films. ), Billy Preston 1946 (Musician. Also worked with the Beatles. A clip? Why not. All together now... Why can't we be humble...), Mark Harmon 1951 (Simon Donovan. ), Jimmy Connors 1952 (Tennisy bloke. ), Carlos Valderrama 1961 (Footy bloke. ), Keanu Reeves 1964 (Theodore Logan. ), Lennox Lewis 1965 (Boxy bloke. ), Salma Hayek 1966 (Mexican actreth eth eth eth eth. ), Danny Shittu 1980 (I do apologise. Footy bloke. ), Joey Barton 1982 (Another footy bloke.) and Javi Martinez 1988 (Yet another footy bloke.). Here on the farm in Cambridgeshire, I do like the music clips you include each week. Nice to hear Hugo Montenegro’s version of Ennio Morricone’s The Good, The Bad and The Ugly. Here’s a teaser for you. What early seventies kids’ programme about a musical group and featuring a future teen idol, had music composed by Hugo Montenegro? D. Parr, Tridge Farm, Ely. Defender Miguel Britos was shown a first-half red card for a high and reckless challenge on Brighton's Anthony Knockaert, who was lucky to escape injury. In a game of few clear-cut chances, Brighton came closest to making the breakthrough as they twice hit the post through Knockaert and Tomer Hemed. But Watford's 10 men held firm to claim a point. Matt ‘The Doctor’ Smith nodded QPR in front before their former winger Junior Hoilett equalised by blocking goalkeeper Alex Smithies' clearance. Sol Bamba's header gave Cardiff the lead and the win. Ooh! ’It the bar, again! Tom Barkhuizen had the best effort of the first half as his shot was pushed onto the post by Boro (and ex-Motherwell) keeper Darren Randolph, who also saved well from Paul Huntington just before the break. Randolph was forced into another fine save from Sean Maguire after an hour. Ooh! ’It the bar, yet again! The U's should have been ahead inside a minute, with Ade Azeez firing wide after being played in by Uche Ikpeazu (That would score a bit in Scrabble), before the pair combined again and Ikpeazu's shot was deflected over. Jevani Brown saw a powerful effort parried by Shrimps goalkeeper Barry Roche, and Brown then laid the ball off for Azeez to fire into the side-netting after 19 minutes. Morecambe's only real chance of the half came when Aaron Wildig's volley from Patrick Brough's cross hit defender Leon Legge and deflected wide. The Cambridge pressure continued in the second half with Roche saving from Azeez and Dean Winnard producing a superb block to deny Ikpeazu after the forward had beaten two men and burst into the box. Morecambe could have stolen the lead in the 67th minute but Garry Thompson blazed over from close range when Aaron McGowan's cross fell to him. Oliver Lancashire headed Lewis Young's cross into his own net in the 36th minute, before late goals from Jordan Roberts and captain Jimmy Smith sealed the points for the visitors. A bit more whopping than usual. Teaser time. Yay! Last week I told you that Chelsea had won the FA Cup seven times in all with seven different managers, only one of whom was English and I asked you who that was. The answer was Dave Sexton who was in charge for the club’s first FA Cup win in 1970. The others? Ruud Gullit in 1997, Gianluca Vialli in 2000, Jose Mourinho in 2007, Guus Hiddink in 2009, Carlo Ancelotti in 2010 and Roberto di Matteo in 2012. One for this week? Indeed not. There are two questions for you this week; both relating to the same man. Question 1 - Which Yugoslav born full back made 167 appearances for Southampton in two spells? Question 2 - Who did he manage to a Scottish Cup Final success in 1994? One to ask down the pub, I reckon. And finally, Cyril? And finally Esther, in the week that marks the fourth anniversary of Stewart’s funeral, I thought a few words on suitable songs to be played at funerals might be apt. Nowadays, rather than a hymn, funerals tend to end with a song suitable for the person who has died; perhaps a favourite of theirs; perhaps one considered appropriate to the occasion. Some of those selected are a little bit bizarre. Apparently, the Countdown theme is quite a popular, if rather tasteless, choice. The same can be said of the Queen song I mentioned just a few weeks back - Another One Bites the Dust. A wee bitty sick, don’t you reckon? Nonetheless, it is a popular funeral toon. Similarly appropriate, but inappropriate if you follow my drift, songs are AC/DC’s Highway to Hell or the Wizard of Oz song Ding Dong the Witch is Dead. What about Going Underground by the Jam? No, I don’t think so, but they are apparently popular choices these days. I suppose a nice cheery song is good after the rather sombre affair that is the standard funeral. Always Look on the Bright Side of Life from The Life of Brian is very popular. Morecambe and Wise’ Bring Me Sunshine and Bobby McFerrin’s Don’t Worry, Be Happy are others. Popular TV themes are often selected. These tend to be programmes that the deceased enjoyed. The Coronation Street theme for a fan of soap operas, the Match of the Day theme for a footy fan and Soul Limbo (The Test Match Special theme) for a cricket fan are all played regularly at funerals. The Eric Idle song from One Foot in the Grave is another jokey one that is often used. Sometimes, the wrong choice entirely is made. Lou Reed’s Perfect Day would seem to be a nice funeral-friendly song until you realise that the song is about drug abuse. Not really suitable for a funeral. I recall going to the funeral of someone who liked ballroom dancing. The Fred Astaire song Cheek to Cheek would seem most appropriate, you would think. Unfortunately, the first line of the song goes ‘Heaven. I’m in heaven...’ Oops. Have you ever wondered what the most popular choices are? No? Well, I’m going to tell you, anyway. Here are the top five funeral songs, pop pickers. Orl right? Right. At number five it’s Eva Cassidy committing murder with Somewhere Over the Rainbow. At number four it’s Stoke-on-Trent’s favourite son, Robbie Williams with, you’ve guessed it, Angels. Coming in at number three it’s Time to Say Goodbye. That’s by Sarah Brightman and Andrea Bocelli, not Peter Cook and Dudley Moore. At number two it’s the classic Wind Beneath my Wings from Bette Midler, not to be confused with Wind Beneath my Wheels by Brian Potter. And number one pop pickers? It’s that good old song about bullying those around you and basically not giving a f*ck - My Way by Frank Sinatra. Not arf. But what about Stewart’s funeral, I hear you ask. What was played for him? Well, it was a very odd choice, certainly. It was a song that, for some reason, Stewart and his pals played a lot at break times in school, even though it was already at least 20 years since it had been a minor hit. It seemed appropriate for the occasion because all of those friends came to the funeral. Ladeez and Genullum, here is 2-4-6-8 Motorway.